ISN’T IT ABOUT TIME? To chronicle undocumented war for PEACE? Today is Saturday February 7, 2015. It is the 4th month of Hijrah Calendar: 17th day of Rabi’II , Year 1436. Forty one years ago, it was still February 7 but not Saturday; it was on a Monday, year 1974. It was the 12th month of Hijrah Calendar: 13th day of Rabi’II , Year 1393. Just what did happen last February 7, 1974 in the town of Jolo, province of Sulu? This is my story…what is yours? The montage of war is still vivid in my mind; of mortar shrapnels and bullet shells wheezing by to deadly thud on the ground. How many coconut trunks were devastated? How many human bodies were strafed down by stray bullets and shrapnels? How many old and young people, men and women alike? Was there anyone who even bothered to count? Roaring thunder rolled across Lupah Sug’s sky as well as across the horizon of Sulu’s Ocean; not borne by Nature but by the AFP during Marcos’ regime. We were bombarded by airplanes from above and by navy boats from across the seas. We, young and old civilians, were merely crammed between the firing exchanges of two factions of combatants: we were sandwiched in the middle by our freedom fighters on one side and by government-soldiers (the civilians’ so called defenders) on the other side. Nevertheless, it was us–vulnerable civilians– who were severely devastated, oppressed— because we did not have weapons to defend ourselves, we did not have the means to defy them and fight back; our fate was akin to animals whose destiny were to be slaughtered in the abattoir, stripped of choice. Qadar ALLAH! These memories indelibly clung inside our hearts as Time fleeted by. Scurrying civilians were overwhelmed by fatigue as they wearily trudged the shorelines of Sulu Sea. The strength of their arms and limbs were too overcome by defeat to issue a protest: “Enough please!” Well, the burden that they were lugging in the course of fleeing was sufficiently heavy as well. Cumbersome loads of personal belongings that they carry on their head, hunching their napes, not to mention the burdensome weight that they carry inside their heads as well as the weight they heave inside their chest. Notwithstanding, they willfully trekked and traced the shorelines as they scampered away from their Home, burning aflame. Others have said that it (burning) was the machination of the government so that the freedomfighters would be shooed out of their sanctuaries. Still others have said that the culprit was the military who initiated the burning but thereafter “the martyred witnesses” who valiantly fought in the name of Ancestral Homeland, Indigenous Race and Islam— were the ones who set further ablaze the fire. Where are the vestiges of the MNLF history in 1974? Where have all the widows and orphans of the martyred ones gone? What Fate has befallen the unforgotten heroes’ widows and orphans? 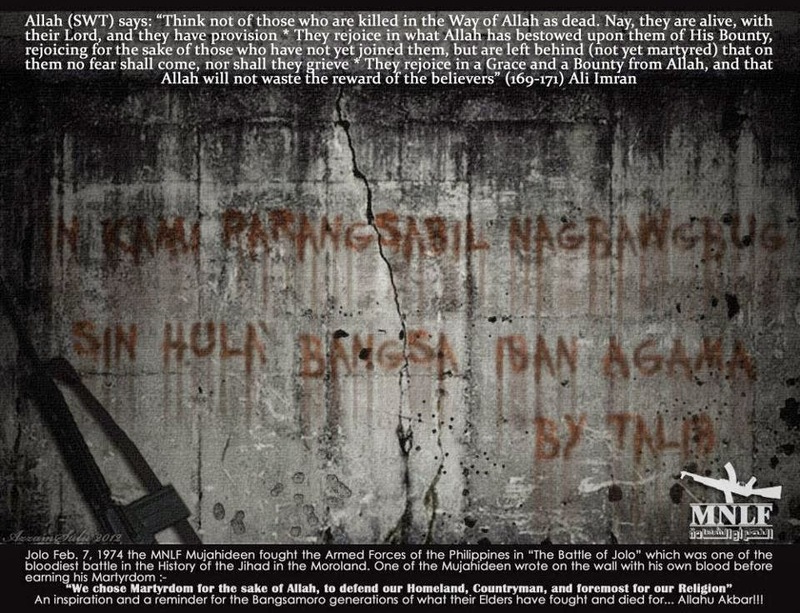 Were the traces effaced from the pages of Bangsamoro history? Or, were these narratives have actually never even been inscribed on the pages of our history? Not even were they inscribed on the pages of our human minds? How long have they really held Jolo under siege? We wonder about the Truth. Did the Truth dissolve into oblivion along with the shahids just like how “ The Witnesses” vanished into their hallowed graves? Inna lillaahi wa inna ilayhi raji’un….To ALLAH we belong, and to ALLAH we all shall return…. O Allah, forgive our living and our dead, those who are present among us and those who are absent, our young and our old, our males and our females. O Allah, whoever You keep alive, keep him alive in Islam, and whoever You cause to die, cause him to die with faith. O Allah, do not deprive us of the reward and do not cause us to go astray after this). Ameen, Ameen. Ameen Ya Rabb! Allaahu akbar! Allaahu akbar! Allaahu akbar! “Allaahumma ighfir lihaayina wa mayitina wa shaahidina wa ghaa’ibina wa sagheerina wa kabeerina wa dhakarina wa unthaana. Allaahumma man ahyaytahu minna fa ahyihi ‘ala’l-Islam wa man tawaffaytahu minna fa tawiffahu ‘ala’l-eemaan..Allaahumma laa tahrimna ajrahu wa la tadillanaa ba’dahu.